Along with gross motor control, balance is an essential skill. We use it every time we maintain any controlled body posture or position: standing up, hopping on one foot, riding a bike, walking, or simply sitting without falling sideways. Children need their balance skills for many things beyond their physical actions. Increased mobility and stability of their bodies mean that children between 2 and 4 years of age start venturing more into pretend play alone or alongside peers, they begin playing games that involve sitting (like drawing or coloring), and they start asserting their independence by putting clothes on and off, or by using a fork to eat with increased autonomy. According to the American Academy of Pediatrics, around 36 months of age, most children can seat themselves in a child-sized chair, bend over without falling, climb the ladders in the playground, and even walk four or five steps on their tiptoes without help. Then, approaching 4 years of age, your daughter’s balance skills will be sufficient to let her stand easily on one foot for at least two seconds. But balance skills don’t end during the preschool years! A group of researchers from Taipei Hospital looked into how balance skills develop through infancy into what we’d think of as an “adult-level” of balance. Their findings, published in 2009’s International Journal of Pediatric Otolaryngology, suggest that balance skills start spiking around 36 months of age, and children achieve optimal balance by the time they are 12 years old. This is why it’s so important to help your child build a stable and strong base for skills like these during her early years of childhood. Dance together to some fun music. You can model moving upper and lower body parts to the rhythm of a song. If your daughter gets really good at this, you can try playing “Musical statues”. 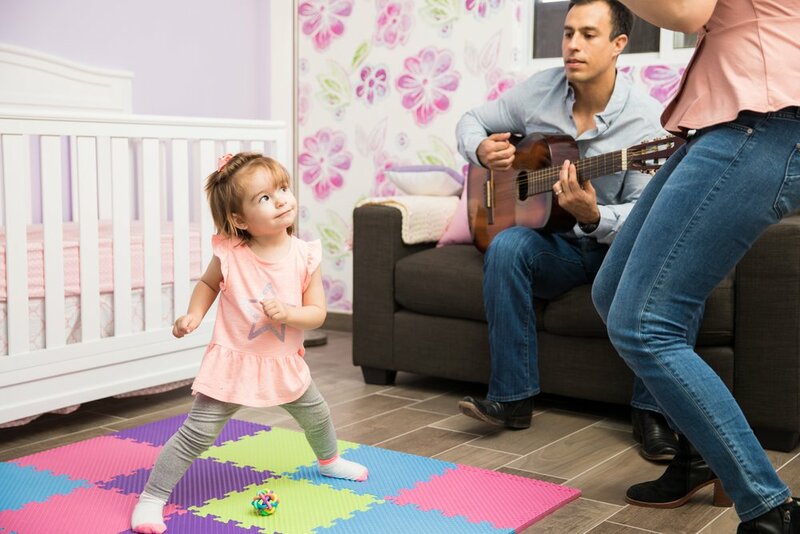 When sitting on the floor playing, encourage your child to sit with her legs crossed. By doing so she’ll engage her core muscles to maintain an upright position. For your 3 to 4-year-old, you can practice learning to pedal a tricycle.